After we took a seat in the Teen Fiction tent at the National Book festival, we didn't move for 3 hours. Lois Lowry was on deck for the afternoon, and I was anxious to hear how this author got her ideas and how she arranged her writing life. She told us that she worked alone, with little if any feedback about her work, until it was complete. She explained that she was happy to tell any story that had meaning to her,whether it was science fiction, realistic fiction or historical fiction. The stories always started when she asked herself, "What if...?" During the Q&A portion of her talk, she was asked,"Which novel do you think is your greatest accomplishment?" She responded, " My greatest accomplishment is not one of my novels, but my children." I first read Lowry in the early 90's when the book The Giver was published. It is an award winning science fiction novel used regularly in middle schools. Lois Lowry was at the festival promoting the novel Son, which is the story of the baby Gabe from the Giver. If I had to recommend one of her novels, I would suggest starting with Number the Stars. This is probably because my favorite genre is historical fiction. Even so, this is one story of hope that we all should know about. Number the Stars is a story of the western front of WWII as told by a 10 year old girl. It recounts the true events surrounding the Danish Resistance efforts to smuggle almost the entire Jewish population out of their country before they could be herded onto the trains that would take them east to the concentration camps. Like many tales of history told through the eyes of a child, the actions are boiled down to the simplest elements. Innocence shows the way as we are reminded of the terror of war. The heroic actions of this nation remind us all that pride and decency can't be stamped out if hope is still alive. There are many novels for both children and adults that focus on this period in our world's history. This story of hope can be an easier way to begin telling our young readers about these events. The horror of the time is made clear, but it is balanced by the determination of a free people. What are your favorite books about this time in history? The National Book Festival was a success. I saw many inspiring authors and great story tellers. To create some type of order, I am going to start at the beginning. The first author we listened to was Mike Lupica. He is an accomplished sports writer and has published many books for young readers, 4th-7th grade. The books are simple but well written and always tell a story about friendship and teamwork. His first novel was Travel Team. The events in the story mimic Lupica's real experiences when his son was cut from the community basketball team. When a boy, Danny Walker, is cut from the local team, his father reminds him that he is not the only one. This gets him to thinking, "What if I created a team of all of the cut kids and give them a shot at the title?" This is exactly what he does, and Travel Team is the story that chronicles the events. As usual, the kids do play well, but mostly come away from the experience with an understanding of what true friendship means. It also reminds us that if we are knocked down, we always win if we just get up. If you have a kiddo in your house who fights you on reading, but is an athlete, Mike Lupica's books are a great place to start. He has written about most sports, sadly not swimming, and there are always strong male and female characters. These books are fun to read and filled with wonderful life lessons. So, Today we travel to Washington D.C. for the National Book Festival. I am a lucky girl! I am going to dive head first into conversations with authors and devour every word. I will give you details when I return, which won't be until the end of the week. So, until then, find a good book and let me know how it is going. I will check for comments and be back to the blog Thursday. I am coming up for air and a little human contact after delving back into the second book in the Century trilogy, Winter of the World, by Ken Follett. I am loving picking up the the families I came to know in the first book, The Fall of Giants. This may seem a strange recommendation for a young reader, but it is a wonderful book. I would willingly let a child in middle school or better, who is not intimidated by the size, give it a whirl. It is historical fiction at its best. It gives any reader a wonderful look at the western world at the turn of the century. And, there is a second book now available. Kids seem to love a good book series. The action begins on June 22, 1911 on the day of the coronation of King George the V. From here we are slowly and masterfully introduced to five families from different countries: USA, England/Scotland, France, Germany, Russia. They are from all walks of life. They each have a different degree of political influence. We will follow them, in Fall of Giants, through WWI, the Russian Revolution, Women's Suffrage, and the Industrial Revolution. With a cast of characters this big, if you can imagine it happening in this time period, you should count on finding it on the page. It is 985 pages long, so this is not for the faint of heart. But, if you have a committed reader, I would encourage you to help them along their way. I bought a copy today for one of my 8th grade bookclub members. She is going to love it. Yes, The Outsiders again! We just can't get enough of it at our house. It seems we have been living in 1965 Tulsa around here lately. My son had to read The Outsiders as a companion piece to his required reading book this past nine weeks. He loved the book. He has now chosen to use it as the subject of a book talk and a literary essay. He has read it twice in the last month. And, with every page turned, he has some new insight to share with me. This book, written over 40 years ago by a 15 year old girl, has changed by son's view on people and how they can be judged. If you haven't read this book, I would say it is a must. My memory tells me I read it as a youngster, but it is possible I just saw the movie, which was released in 1983. (We watched it last night. The actors, the best looking boys of my youth, looked like babies. Was I ever that young?) I did read it this past month with my son and I was struck by the beauty of its simple prose. I love that a boy is so sensitive and aware. I love even more that, because of Ponyboy, my son now feels he has permission to be just as sensitive and aware. The arc of each of the characters tells young people that we are all able to change dramatically, no matter what our circimstances. It also reminds us that we are all people first. Labels like "soc" and "greaser" come later and have little to do with who we are on the inside. If you are living with an 11 year old or better, I must recommend this novel to you. I am sure you will dig out lessons that we have yet to find. Please let me know what you think. I got an email the other day from Barnes & Noble announcing that many of Roald Dahl's books are now available on the nook. He is among my favorite authors for children. He writes with wit and humor. His characters are original. He always entertains me. What do I think of the books being available on the nook? I think it is great. My goal for children and young adults is for them to incorporate reading into their leisure time. Even more, I want them to have stories in their lives. If they do this by picking up a book, turning on an eReader or listening to a recording, I will be seen quietly doing a happy dance. What is you child's favorite way to access stories? I am not sure if I've mentioned it, but I think of myself as an oval peg. I have lived in this town most of my life and know just about everyone, or I know someone who knows them. But, just because I know them doesn't mean I "fit in." I suppose that is one reason I love to read. I meet new people everyday and not one of them ever judges me! When I read a summary of this book, Seraphina, it had immediate appeal, because the reviewer was selling it as "a great dragon" fantasy, about a girl who was trying to live in two different worlds. This is something with which I am familiar. Seraphina, our hero, lives in the castle as the Mistress of Music. She lives in a land where there has been 40 years of peace between dragons and humans. During these forty years humans have become somewhat more comfortable with dragons, because they can assume human form. Seraphina is close to both humans and dragons. Seraphina has a secret. Slowly throughout the course of the book the secret is revealed, first to the reader and then to the other major characters, one by one. We are asked to accept Seraphina in spite of her secret. The major characters are, too. And, in the end, not only did I accept her, I found myself loving her, because of her secret. My son, just finished the novel himself. And as we were discussing it, I was reminded that this is how change comes about. First, we fall in love, or like, with the person. Next, we learn about their "flaws." Finally, we soften or change our view on the matter because not having the person in our lives any more is not an option. What a wonderful theme for the making of a better world filled with understanding. Book club is going well, and I am meeting many new readers. It is one of the highlights of the work- finding those kids who have a reader inside, but have been lured away from the page by other activities like computer games, TV , or sports. I received an email from one of the parents thanking me for hosting the clubs and telling me what just one meeting had done for her daughter's attitudes toward reading. With this spark, I decided to give the child a bit of a nudge. "Thanks for giving my daughter the extra book to read. She is devouring it partly because she was so proud you asked her for an opinion. Usually I check to make sure she hasn't gotten up to get on mine craft after bed. Last night she was trying to sneak reading!!!! Eureka!!!!!!!! She was so excited. She said "I can't believe Mrs. Bacon asked me to read this and not someone who's been in book club longer!". It's amazing how a little thing to us can empower a child! She's having a little bit rougher year. So that extra attention has really boosted her." Magic... She is hooked, and if we all stick together, this girl will be reading for fun for the rest of her life. "Siblings Kate, Michael, and Emma discover a book that transports them back fifteen years in time. 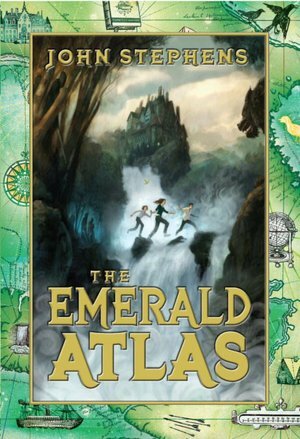 Thus begins their adventure with the Atlas, one of three Books of Beginning--powerful magical volumes whose secrets brought the universe to life. This imaginative and enjoyable series starter explores the bonds of family and magic while setting up an inevitable good-versus-evil showdown." I will be getting feedback from my new friend soon, if the sneak reading continues. Please read it with your middle reader and let me know what you think. It is game day in Arkansas, and the state is dripping in red. The game is in Little Rock, and fans from all around the state will flock to Arkansas' center to attend. My husband will record the game or watch it in snippets, because our son is a swimmer and I am, well, a reader. As I tried to think of a good book or author to recommend today, this cover came to mind. The jersey could be one of our own, though I understand there have been changes, disliked by some, to the uniforms. The novel Game Changers is the first in a new series of sports books for middle-graders, by Mike Lupica. He adds this to a long list of other sports books as well as his New York Daily News column that is syndicated nationally. Game Changers is a story about a young boy named Ben. He is athletic, smart and well liked. He is dedicated to football and has learned to fit in at almost any position. He wants to be quarterback. There is one barrier to his success...the coach's son, Shawn, who is currently in the position. This the story of how they become friends. Though it centers around football, the main theme is friendships- between kids, coaches and parents. If your reader doesn't play football, try one of Lupica's other books. He has written about baseball, wrestling and basketball, as well. If you have a reluctant reader at home who happens to be an athlete, find a story that involves the sports she loves. It might just be the book that gets them started. and I want to be ready. Please pick up a book tonight and begin reading with your children. I have been frantically reading this week, preparing for my first book club meetings. We have had great success this fall, with nearly 200 kids registered and preparing to join together for fun as they eat a meal and discuss a just-read book. I took a break from the pace to have lunch with a fellow reader and library lover. We were discussing an upcoming meeting with the director of our local library system. We are getting a children's library! And, I am trying to find a spot for my "reading just for fun" advocacy. So, please pardon me if I give the Central Arkansas Library System a shout out and a big thank you for its support of children. Anyway, at lunch my friend mentioned that she has had to stop listening to the radio and the news because of all of the political chatter. I told her, "I can appreciate your point of view, but I just can't tear myself away." I keep hoping that one day they will be discussing policy and not the Mormon faith. But, I guess this might mean I have something to learn. 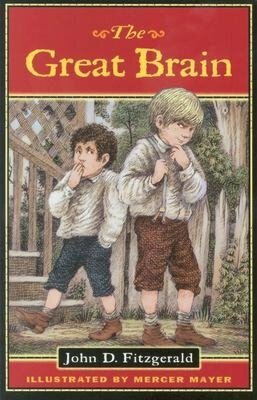 This point was driven home when I picked up the book selection for 4th grade, The Great Brain by John D. Fitzgerald, and discovered on page 1 this line--"Adenville had a population of 2500 people, of which about 2000 were Mormons and the rest Catholics and Protestants." Please do not misunderstand, this is not a religious book, it was just a strange coincidence, and I found it fascinating. This book is a delightful look at the turn of the last century. It takes place in Adenville, UT in 1896. In my experience, children of 2012 are amazed to find that most people can't imagine having a toilet indoors, that ice cream can not be purchased in a store, and that most toys were homemade. These historic realities unfold as John's older brother Tom puts his "great brain" to work to con the children and the adults in the community out of their last penny. It is simply told through chapters that read like short stories and is filled with many life lessons. Among them, be kind to all, the importance of family, and that the adults in a child's life can be depended on to help in a crisis. I will let you know how it plays with this current brood of readers. If you've read it yourself, let me know what you think of it.